This one-of-a-kind vest is totally seamless, which means it is reversible and two pieces in one. The multicolored side is a real "statement piece", and the other side a little more subtle but gorgeous blue with black silk veining. All silk was uniquely dyed, with some silk wrapped around rusted objects to "rust dye". 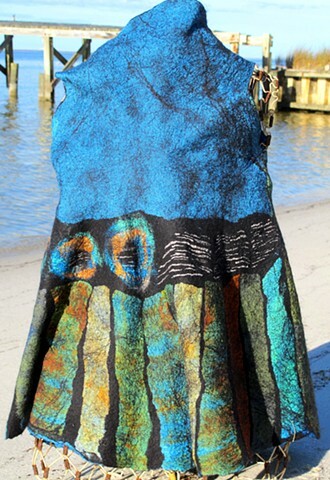 Silk and merino wool are fused together using the technique called "nuno felting" to produce an organic and original piece of wearable art. Fiber content may include: Habotai Silk, Merino Wool, Bamboo.